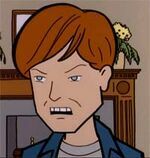 Graham is one of the three obnoxious students (along with Lara and Cassidy) encountered by Daria and Jodie Landon at Grove Hills, in the episode "Gifted." He is incredibly condescending, egotistical, and arrogant, dismissive of anyone he perceives to be less intelligent. He tells Jodie she needs to get into Grove Hills before her opinions on anything matter. He also started shunning David and lamenting how he stopped being "interesting" after he got a low score on his SATs (relatively low, David had actually got into the 90th percentile), and is amazed he has "the nerve" to turn up to an event. When Daria snarks that tests help you "know who your real friends are", Graham replies "right" before he realises she's making a joke at his expense. Graham is driven by material success, gleefully waiting to be rich: "I can't wait to stroll down the Riviera with a model on each arm." He jokingly agrees that he hopes he can be smart and morally bankrupt. The driving force behind all this is that he's still traumatised and vindictively obsessed with having been a bullied outcast in public school. When talking about the benefits of Grove Hills, without prompting he started to seethe about "idiots and fools and a quarterback who tells the whole school you shower in a towel. I'd like to see a quarterback write a paper on Mao". All this time Jodie had been trying to be polite and sociable but quickly loses her temper against Graham when he dismisses her opinions by stating that she isn't in Grove hills yet and there for there's no reason to take her seriously. Jodie goes wide eyed in anger and shouts: "HEY, because some jock made you feel like the loser you are, don't take it out on me!" to which he responded "I'm NOT a loser! I have a 165 IQ!". She tells him he's "boring and miserable", and he threatens to make sure she never goes to Grove Hills (likely an idle threat). Notably, while he tries to dismiss and belittle Jodie, who'd spent the previous conversations being polite and sociable, he doesn't try to do it to Daria, who'd shown she didn't care about that and was willing to insult him. In the Legion of Lawndale Heroes series, he is known as Alexander Milhous Graham. He finds out that he and his parents are members of The Elite. In TAG's "A Hard Days' Night," Graham is part of the Irregulars, an all-boy team of adventurous science nerds led by genius inventor Andrew Landon. The team investigates paranormal events and attacks against Lawndale. Though brilliant, Graham is arrogant and impulsive. In Shiva's Losers No More, Graham Alexander realizes that Jodie was right, reconnects with David, and transfers to Lawndale as part of an attempt to improve as a person. This page was last edited on 16 January 2014, at 01:04.